It’s very common around Christmas to begin hearing the word “Emmanuel” used. Many people even know it means “God with us.” But because of its frequent usage, I believe it’s lost a lot of its power and strength. Growing up around church, over the years I guess I’ve just accepted the Christmas story and Christ in general as something that’s expected. We’re weak; therefore, God had to come and save us. Of course God loved us enough to die for us. Of course God should be “with us”. 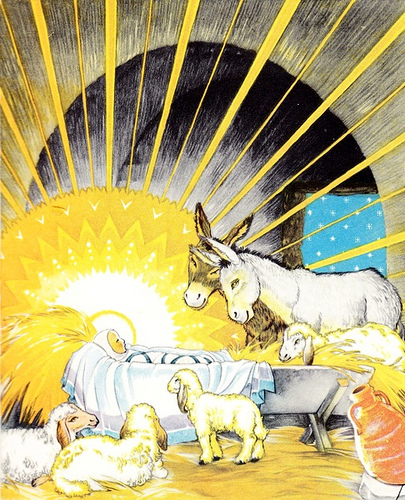 We dress baby Jesus up in a manger and arrange figures of animals and wise men around him and envision it as this peaceful, perfect night. But it was anything but that. For those who’ve ever been on a farm and around stables, you know that it is not the cleanest environment. It smells. It’s loud. There’s bugs. There’s manure everywhere. It’s much more realistic to think of baby Jesus being born next to a stinky, pile of crap and the animals causing all kinds of noise. Not quiet as holy and peaceful, huh? But of all the places in the world to be born, God chose a stable. If a meager manger was good enough for God, what does that tell me about all my selfish desires and wants? From day one, Jesus was our “wonderful counselor”, showing us the example of humility. “…Christ Jesus, who, though he was in the form of God, did not count equality with God a thing to be grasped, but emptied himself, by taking the form of a servant, being born in the likeness of men.” (Phil 2:5-6) He did not come into a perfect world through a perfect birth, but to a broken world through a lowly birth. Too often we forget that. We think it’s natural for God to come to us, but it’s not. When have kings ever left their throne to walk among the sick, beggars, and lame? Isn’t it that much more powerful that the King who hung the stars in the sky and breathed the universe into motion, came to us as a weak, innocent baby? For us, it is natural to think of Jesus being born, but to the Jews it was a hard pill to swallow. Even though there are hints of the Messiah’s divinity in the Old Testament, the majority of the people believed that God would send them another ruler similar to David, who would rule by force and power. They never would have imagined that the Messiah would have been God himself. “God with Us” referred to giving the Jews a ruler to know that God cared and was on their side, not in the literal sense. The Law allowed only the High Priest to enter the Holy of Holies to be in the presence of God. We’re not talking about seeing God, but just being in his presence. If only one person was worthy to even be near God, why would they believe that God would become human and dwell among us? They didn’t, which is why so many Jews rejected Jesus. But I believe we take it for granted that God is with us. He made himself nothing so that we could reach him. There is no other religion that believes anything like the divinity of Jesus. Either God is way too powerful and mighty to pay attention to weak, fallen humans, or we’re all apart of God and together we make up God. The religions of the East probably come the closest to Jesus through gods like Krishna who appeared in human form, but they were in form only. They were not fully human and fully God. And that’s what sets Jesus apart. We have a God who loved us so much that he wanted to dwell close to us and close to our hearts. He humbled himself from day one, living as a divine example and a beacon of light in a world of darkness. Who can say that God doesn’t understand us? For he is the “Wonderful Counselor, Mighty God, Everlasting Father, Prince of Peace”, but most of all he is Emmanuel – God with us. This entry was tagged christ, Christianity, Christmas, emmanuel, god, immanuel, jesus, messiah, Spirituality, the christmas story. Bookmark the permalink. He is with us and will never leave us. Not only is there but one Jesus, set apart from the rest, but He is also the door that we need. It’s always baffled me how the Jews, who walked with Jesus, don’t believe that He’s the Messiah. I was just researching that a few days ago. Their take on it is interesting, but still baffling. I agree, but just as the Jews were blind to Him, so are many of us today. Even those of us who are Christians..how many times is He showing up and trying to become a deeper part of our lives and we ignore or dismiss Him? What baffles me even more is how all the Apostles denied Him at some point. Our rejection is a desire of everyone of us and we need to always be alert and aware of His presence. “…the light has come into the world, and people loved the darkness rather than the light…” He is always with us, but sometimes we don’t want to be with Him.